Discover the benefits that dairy proteins can have on all lifestyles. This brochure examines the many positives that diary proteins have on building muscle mass, curbing hunger, maintaining healthy weight and more. 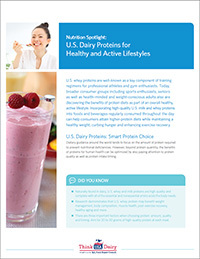 Use this resource to get a better understanding of how and when to use dairy proteins to improve your healthy lifestyle.